Matondkar is pitted against BJP MP Gopal Shetty, who defeated former Mumbai Congress chief Sanjay Nirupam within the 2014 Lok Sabha poll. 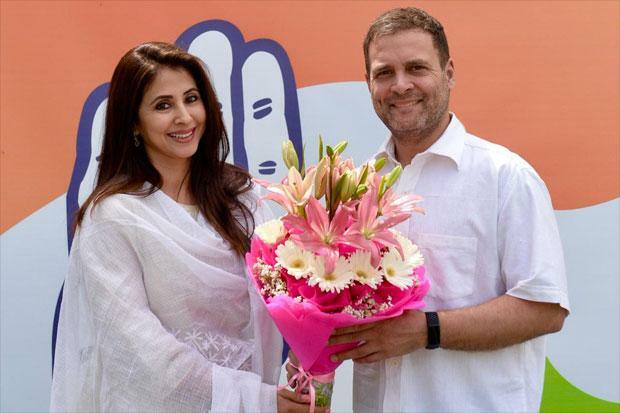 Matondkar, who has appeared in popular Hindi films like "Rangeela" and "Satya" and in the critically-acclaimed "Masoom" as a child artiste, will make her electoral debut with the April 29 poll in that constituency. In the past, the Congress had fielded Bollywood actor Govinda from the Mumbai North seat, which he won. According to sources in the Congress, the party was looking for a known face to take on Shetty, perceived as being a strong candidate. The search ended with Matondkar, the source added. "Some celebrities recently got associated with the party. Matondkar happens to be the most popular name among them," the source said. BJP leader Ram Naik, currently the Governor of Uttar Pradesh, had represented the constituency between 1989 and 1999. Naik's winning streak came to an end in 2004, when actor Govinda defeated him. Govinda didn't fight the 2009 election, which was successfully contested by Nirupam. The Congress has also announced its candidates in four other Mumbai seats: Mumbai north-west (Nirupam),Mumbai north-central (Priya Dutt), Mumbai south (Milind Deora) and Mumbai south-central (Eknath Gaikwad). The Congress has shared the Mumbai North East seat with its grand alliance partner, the NCP. Hit by the Narendra Modi wave in the last election, the Congress could secure only two seats in Maharashtra in the 2014 general election, failing to win any of the five seats it contested in Mumbai. All the Lok Sabha seats in Mumbai will go to polls on April 29. As part of its seat-sharing arrangement with the NCP and other parties, the Congress is contesting 24 seats of the total 48 constituencies in the state. It has so far declared 23 candidates in Maharashtra and is yet to name a candidate from the Pune constituency. The NCP will field candidates in 20 of the seats in the state. The Swabhimani Shetkari Sanghatana led by MP Raju Shetti will contest two seats, while the Bahujan Vikas Aghadi and Yuva Swabhiman Paksh will contest a seat each.